When it comes to social media monitoring, don't just listen to your own corporate channels. You must go further. Social media offer a very good opportunity for companies to get to know their consumers’ insights instantly and thus improve their customer experience. Consumers often talk about a brand’s product or service on their social media profiles without mentioning it, and yet they are not aware that the same company may be listening to them. Here’s where social media monitoring comes into play. Therefore, to improve customer service through social media, companies must go further and listen to their customers outside the brand’s own corporate channels. In this way, the customer will be surprised in a positive way as it is demonstrated that the brand takes into account their opinions and concerns. It is likely that, even without the answer to his tweet and pastries, Mike would still have had a positive opinion of the company. However, he would not have been as delirious about Delta Hotels as he was. 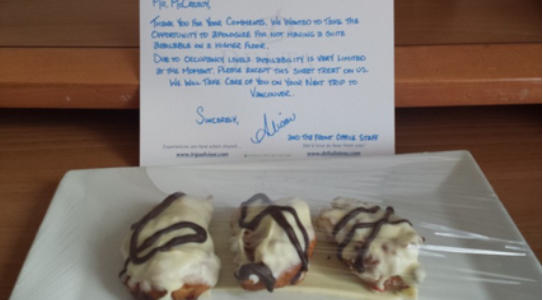 Thus, thanks to the listening of social media outside the corporate channels themselves and the cost of a few pastries, Delta Hotels left a strong impression on a client with a huge shared social media return. Thanks to social media monitoring tools like the Websays Dashboard, listening to consumers outside your own channels is possible and will also allow you to make a positive impact on your brand image and customer experience. If you are interested in our services, schedule a free demo here.